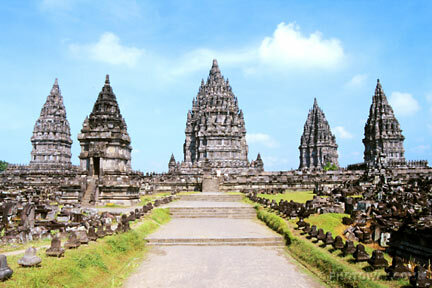 Prambanan is the largest Hindu temple complex in Indonesia, even in Southeast Asia. The temple is also known as Rara Jonggrang temple was built around the year 850 AD by the Sanjaya Dynasty.Temple since 1991 by UNESCO as world cultural heritage (World Heritage Wonder) This complex occupies an area of ​​39.8 hectares. Rose as high as 47 feet or five meters higher than Borobudur temple, Prambanan seemingly strong and sturdy. This is consistent with the background of the construction of this temple, which wanted to show the glory of Hindu civilization in the land of Java.Then why is also called Candi Prambanan Jonggrang Rara? It is associated with a legend which is believed to be partly the Java community about this temple. Once, a prince named Bondowoso fell in love with a beautiful princess was her face, she benama Jonggrang Rara. Since no power to refuse the prince's love, Jonggrang Bondowoso to submit the terms to the temple with 1,000 statues made overnight. The request was nearly fulfilled, before it finally managed to ask for help Jonggrang villagers to pound rice and make a fire in order to impress the atmosphere was morning. Feeling cheated, Bondowoso newly made statue-999 to then condemn Jonggrang into a statue to 1000. 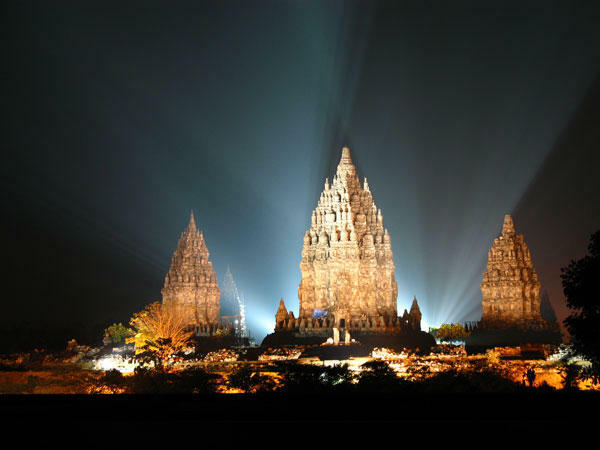 Prambanan is the embodiment of Hindu civilization in the land of Java. It can be seen from the temple structure that describes the core belief in Hinduism, namely Trimurti. 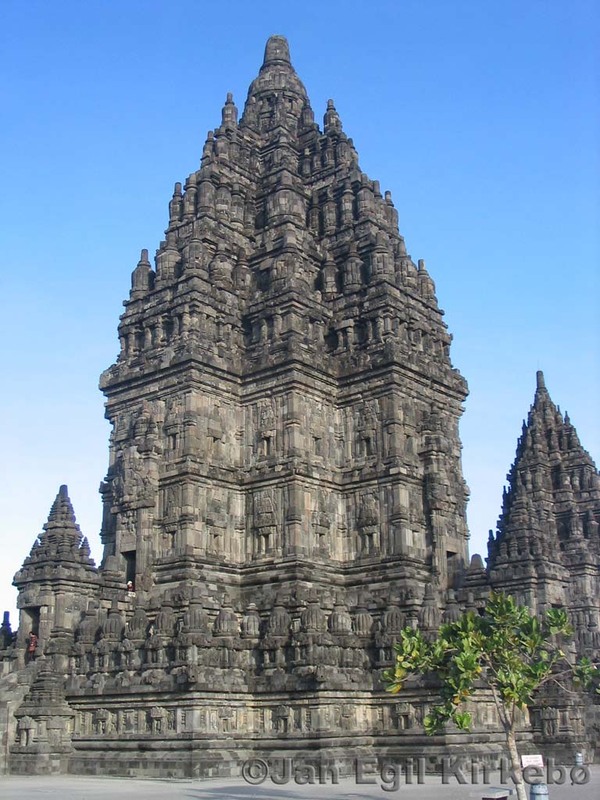 Prambanan complex has three main temples in the primary yard, namely Vishnu, Brahma, and Shiva. These three temples are symbols of Trimurti in Hindu belief. Each main temple has accompanying temple, namely Nandini for Shiva, Swan to Brahma, and Garuda for Vishnu. In addition, there are two temples wedge, 4 temples color, and 4 corner temples. In the second there are 224 temples. Prambanan other privileges that must be witnessed by tourists is the beauty of relief-relief on the wall of the temple. The story of Ramayana to be the main reliefs of this temple. However, other relief that is not less interesting is the Kalpataru tree that the Hindu religion is considered as a tree of life, sustainability, and environmental compatibility. In Prambanan, relief of Kalpataru tree depicted flanking a lion. The existence of this tree describe how the Java community-ninth century had wisdom to manage its environment. For visitors who want to finish the curiosity of the ins and outs of the Prambanan temple, visitors can also visited a museum in the temple complex. In this museum, visitors can enjoy an audio visual history of the discovery of the Prambanan temple until the renovations are complete. For tourists who visited with the family, at Prambanan temple there are also playgrounds for the kids and the mini train that can lead visitors around the tourist area. One of the tour event to be missed is the staging of the Ramayana Ballet. Ramayana Ballet is the performing arts to unite various Javanese arts such as dance, drama, and music on one stage and one momentum to present the story of Ramayana, Valmiki's legendary epic written in Sanskrit. The story of Ramayana is sung in the show is a translation of the reliefs carved on the temple of Prambanan. Ramayana story carved on the temple is similar to the story that develops in the oral tradition in India. The road is long and suspenseful story is summarized in four plays or acts, namely: abduction of Sinta, Anoman mission to Alengka, Kumbakarna or Ravana's death, and the reunion of Rama-Shinta. The play has been running since 1960 and held every month on full moon nights. Prambanan Prambanan is located in the village which is administratively divided into two parts, namely the district of Sleman, Yogyakarta Province and Klaten district, Central Java Province. It lies right on the edge of the highway in Yogyakarta and Solo make the Prambanan temple complex is easy to reach from any direction, either from the direction of Yogyakarta and Solo. 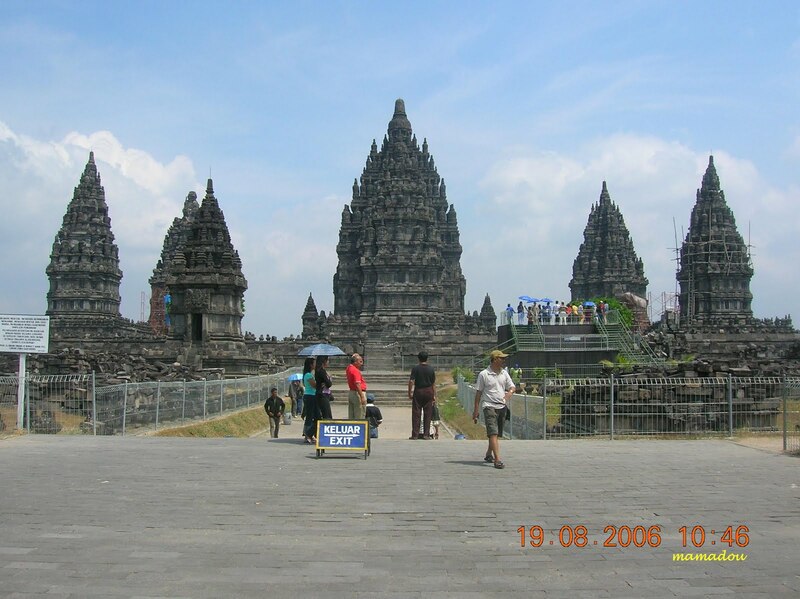 If the direction of Yogyakarta, visitors simply remove the cost of Rp. 4000.00 to get location. If visitors take the bus Transjogja, visitors need only mebayar Rp. 3000.00. Meanwhile, if traveling from the direction of Solo, visitors spend only Rp. 6000.00. For visitors who start the journey from Klaten, many paths to choose from, can use the bus Yogyakarta-Solo majors or major bus terminal-Prambanan Klaten. Both are just as easy. Entrance is distinguished between local tourists with foreign tourists. For the local tourist entrance fee of Rp. 8000.00 while for tourists entrance fee of U.S. $ 10. Prambanan Temple attractions are open daily starting at 8:00 to 17:00 pm. Around the temple complex of accommodation available and facilities are quite complete, such as hotels / lodging houses, restaurants / restaurants, souvenir shops, telecom shops and internet cafes. In addition, the presence of the power tour guide who easily found around the temple will complete the visit of tourists. Because, they will guide tourists to trace-jekak fame Hindu-Javanese civilization with the Prambanan Temple as its main monuments.